Some people have pathological hoarding issues. They keep everything obsessively, figuring that one day in the far-distant future, whatever it is will “come in handy.” Let me tell you something. It won’t. Earlier today, my son threw away a broken paper fan. As he was getting rid of it, he eyed the plastic casing for the fan and said, “Maybe I should keep this. It might be useful.” I, the anti-hoarder, made it pretty clear that a broken fan plastic casing would never, in any way, be remotely useful. Now, if I were to hoard anything in this world, it would be baked goods and chocolate. Earlier, I pulled a chocolate-dipped peanut butter Oreo out of the freezer and munched on it. It had been triple-wrapped and frozen since December. But you know, that stuff never gets hoarded for long. Somehow, even with things frozen away, I can’t forget about them. Now that it’s Girl Scout cookie season, you can be pretty dang sure that I’m storing several boxes of GS cookies in the freezer as well. I’m one of those people who pulls out a sleeve of Thin Mints several months after prime GS cookie selling season and serves them to grateful house guests. If a Thin Mint tastes good in Feburary, its cool appeal is even more seductive in the heat of summer. Now, I’m a Tagalong girl, and that ain’t no lie. But these right here are for you Thin Mint lovers out there. It’s a little bit of an extreme approach, but you know I’m all about decadence. So what’s going on here? Simple. Chocolate cookie dough (egg-free, of course!) 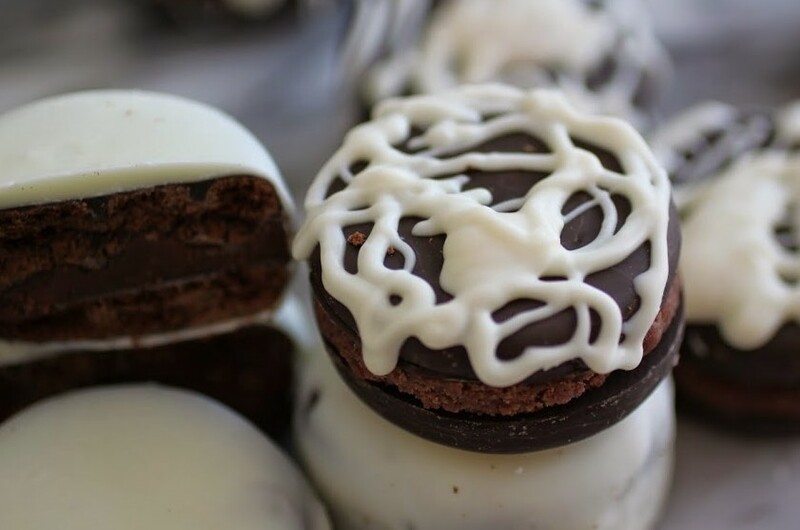 sandwiched between two Thin Mints and dipped into white chocolate. Yep. I did that. Feel free to let the binge session commence. 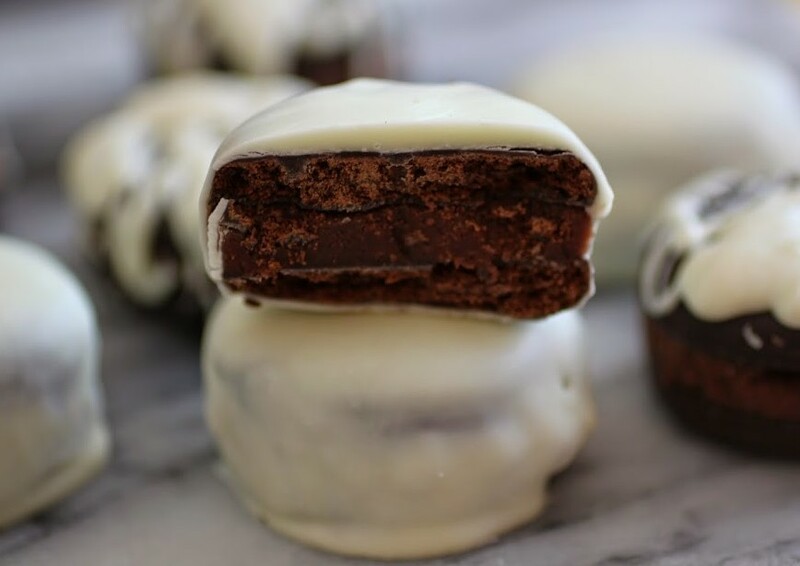 These are actually super simple to make, and you can either do fun drizzliness with the white chocolate or you can dunk the sandwich in whole. Or both, in my case. 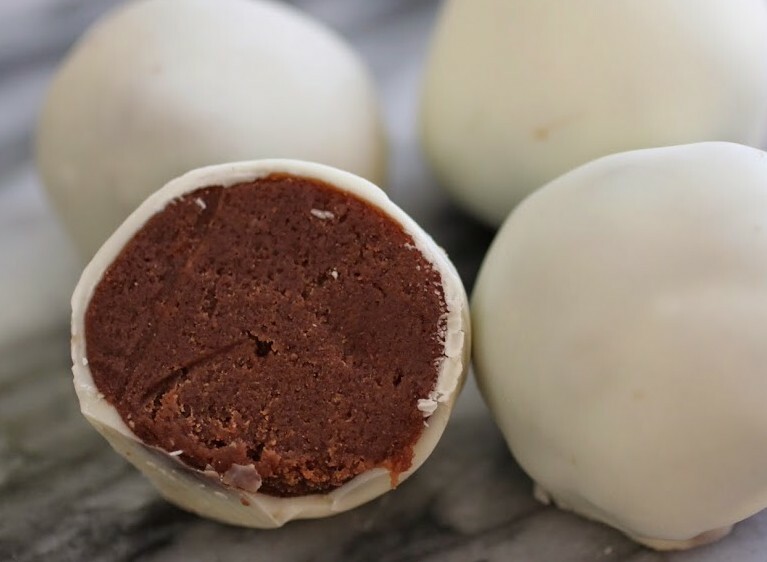 And if you have leftover cookie dough, make truffles! These traveled with me to a housewarming party for some dear friends of mine, and boy, is their new house clutter-free. Seriously not one bit of mess in sight. So I added to it slightly with these bits of Girl Scout madness, and while they could hoard them, my guess is that everyone at the party ate them already. Moral of the story: don’t hoard, unless it’s chocolate. You can make Girl Scout season go a long way! In the bowl of a stand mixer, beat the butter and sugar until light and fluffy. Add the vanilla and salt. Finally, beat in the flour and cocoa until all is combined. Generously scoop the cookie dough onto one Thin Mint (the flat side), and sandwich with another Thin Mint. Run a knife along the outside of the sandwich to flatten the edges. Put the Thin Mints in the freezer for about 15 minutes. Prepare the melting chocolate according to package directions. Working quickly to prevent the the Thin Mint chocolate from melting, Pick the sandwich up with a fork, letting the melting chocolate drip through the tines. Use a toothpick to gently slide the sandwich onto the cookie sheet. Allow the cookie sandwiches to harden. Store in an airtight container at room temperature. ‘Tis the season. No, not spring! It’s unusually cold for this time of year. Nope, even better! Reese’s Eggs are out! Praise the peanut butter and chocolate gods! Of all their products, these eggs are my favorite. The ratio of peanut butter to chocolate is a bit different than with their ordinary cups. Translation: there is more of that amazing peanut butter filling in a Reese’s egg, and that equals happiness. 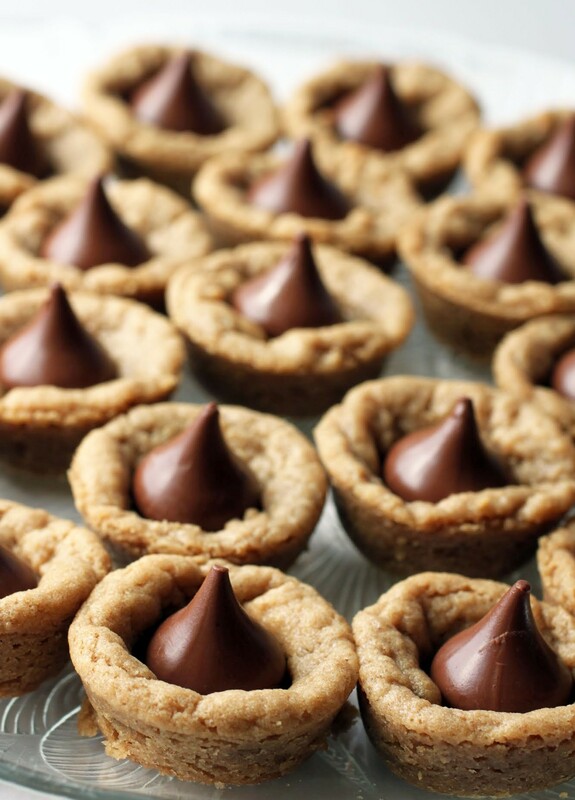 Extreme, sweet, peanut buttery happiness. When I was a kid, my mom would buy us these eggs as a treat, and it was always such a holy moment. I’d unrap the egg slowly and eat it, perfect bite by perfect bite, always sorry when it was over. Actually, not much has changed. I still feel that one egg is just not enough to satisfy my Reese’s-fueled lust for peanut butter. I would definitely be a chocolate hoarder too, nothing wrong with that in my book! These cookie dough sandwiches look amazing! I love how full of mint these babies are. Looks delish! Thanks, Gayle! I always want a supply of chocolate handy! I have never had a girl scout cookie before, as they are not a thing over here, but I have only heard good things about them. I love chocolate and mint together though. There is nothing wrong in hoarding sweets in my opinion 🙂 These cookies look so delicious, another genius idea Mir! Need to try them soon! Thanks, Mira! Chocolate is the only thing I can bear to hoard! If I were to hoard something, it would be definitely chocolates! We can never have enough of it, can we? 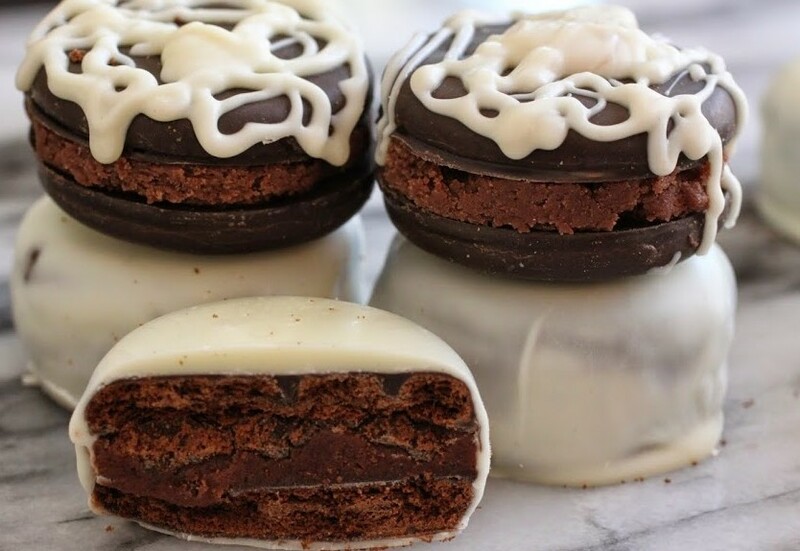 These cookie sandwiches look so delicious, very creative! Thanks, Manali! I love sandwiches, I love cookies. Together, it’s great! haha, I’m with you. . if you’re going to hoard anything, hoard some cookies and sweets!!! 🙂 love these thin mint cookie dough sandwiches!!! yummm! I love the tagalongs, thin mints and the samoas! Thin mints are the best, I love them! So making them even more decadent is pretty much a stroke of genius! These look amazing! More decadent equals better, Stacey! I always stock up and stash away those seasonal yummies too!! 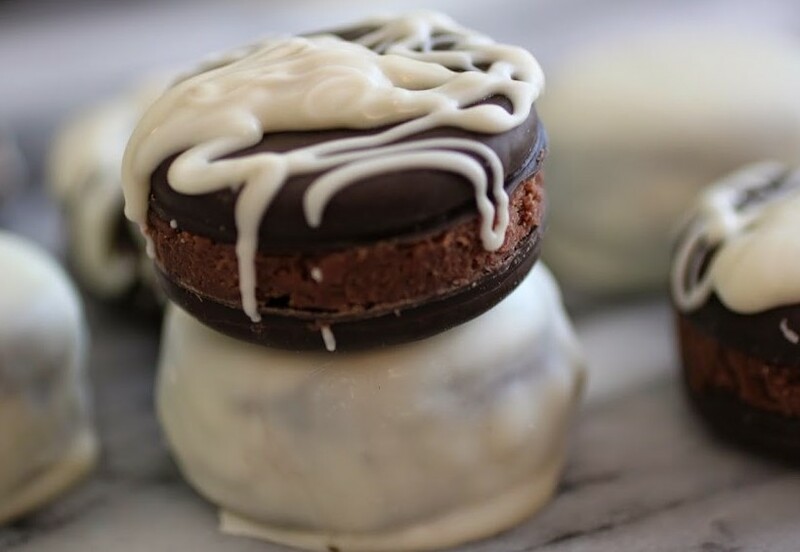 🙂 Lovin the chocolate cookie dough inside–makes Thin Mints even that much more irresistible! Pinned! Thanks for the support, Mary Frances! I just have some strong feelings about hoarding. I’ve seen it do terrible things to people. But chocolate is safe to hoard! Thin mints are the best girl scout cookie in my opinion! They’re so insanely good just straight from the freezer too. 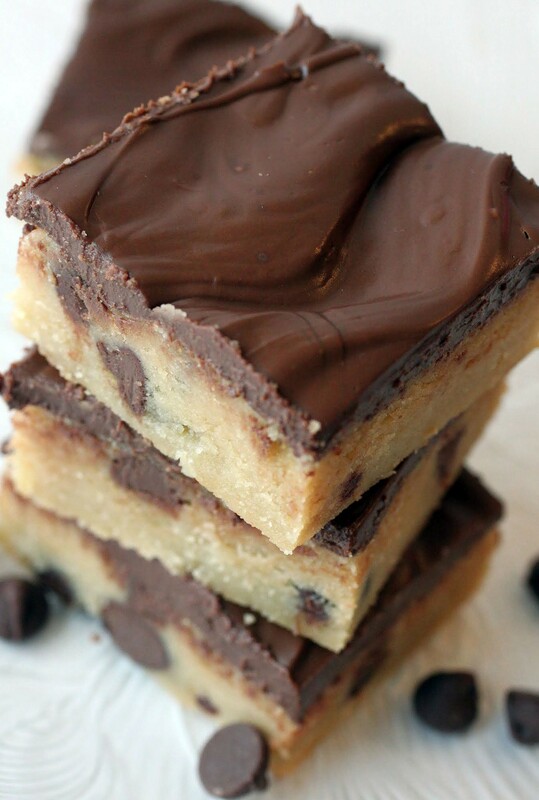 I love that you added a cookie dough middle to these, genius! Thanks, Danielle! Tagalongs are my fave, but I had to make something for the Thin Mint folks! 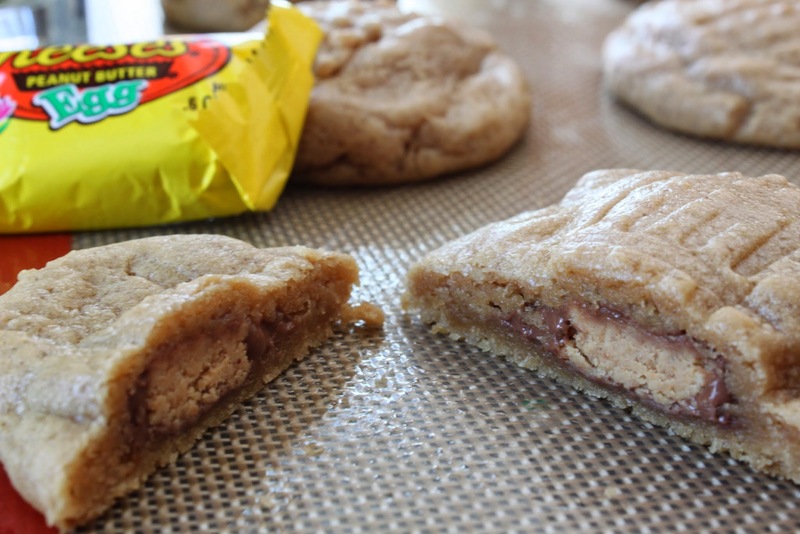 These pictures of your cookies took my breath away and left me a drooling hot mess. Genius! Well, that’s the goal, Rachelle! sign me up for these! YUM 😉 mouthwatering!